Established in 1872 in Tokyo’s Tsukiji area, Seiyoken led the way in opening Japan’s doors to Western cooking. 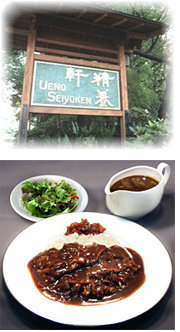 A few years later, in conjunction with the opening of Ueno Park in 1876, Ueno Seiyoken began operation as a spot for dining and social gathering at its present location which offers an excellent view of the surrounding city. Domestic and international high society in its horse drawn carriages flocked to Ueno Seiyoken, which prospered in its role as a stage for Japanese modernization as Western cooking gained ever wider acceptance. In 1920 Seiyoken helped pioneer the creation of wedding halls by building a chapel that was also used for banquets and receptions by eminent and distinguished personages, and to this day it continues in its mission to see that Western cooking prospers in Japan.